If you are looking for a universal protein, it was I found it! This product has in itself seven different protein sources, making it ideal for any time of day. 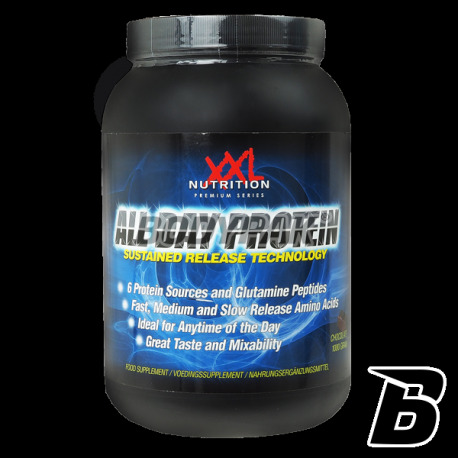 The composition of protein you will find both quickly and slowly absorbable. Seeking protein shake, which is ideal for use both during the day and at bedtime note the XXL All Day Protein, which is based on seven (!!) different sources of protein. An additional advantage is very good taste (to which the producer had accustomed us), and zero problems with solubility of the product. High quality is visible at every step for this product. It would be hard to find a protein more recommendable. Micellar Casein - as whey protein, casein, and that is obtained from milk. It is characterized by the most uniform release of amino acids from all protein sources, including the best for the long gaps between meals, effectively stopping the catabolism hours. Calcium caseinate - is characterized by the most steady release of amino acids into the bloodstream of all protein sources, and thus works best during the long breaks between meals. Albumin Egg - widely regarded as a model protein - contains the amino acid profile that best suits our body in terms of the use to build muscle tissue (biological value BV = 100). Whey protein isolate - very easily absorbed - absorbed from the gastrointestinal tract in just a few - several minutes, has a broad amino acid profile, high biological value BV = 159, rich in alpha-lactalbumin - reducing stress, prevent cancer and diseases, cardiac, lactoferrin, or well absorbed iron and lactoperoxidase, conqueror of bacteria. It has a very low content of lactose and fat, which translates into greater comfort digestion and better absorption of taunts. The hydrolyzate of the whey protein - protein subjected to preliminary digestion of the enzyme. As a result, they absorbed almost instantaneously, providing the body with the necessary building compounds (amino acids). Glutamine peptide - most commonly found in the body amino, performing a number of very important functions: alters the filling process, glycogen by increasing the rate of its synthesis in the liver, as well as by direct conversion to glucose positive effect on the rate of protein synthesis and reduces their disintegration, strengthens the immune and prevents diseases that could hinder training plays an important role in the process of transamination (allows the synthesis of new amino acids), is converted into glutamic acid constitutes a source of energy for the nerve tissue and plays a number of other important, but less important from our point of view, programs. 1 serving (2 scoops) 60 minutes before your workout and 1 serving before bedtime. 1 serving (2 scoops) between breakfast and lunch, 1 serving at bedtime. 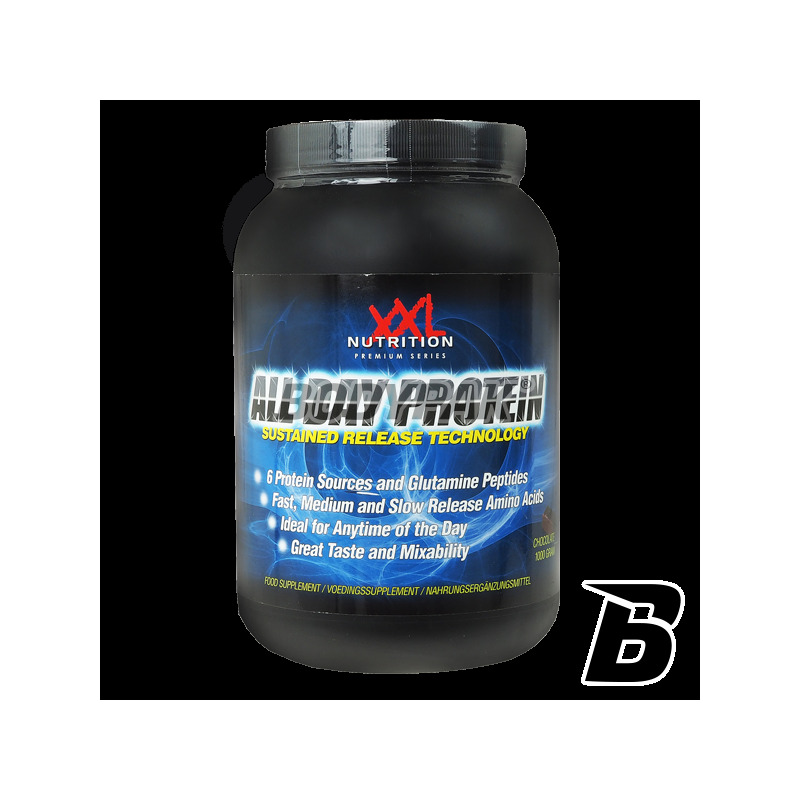 Ingredients: whey protein concentrate , micellar casein, calcium caseinate, albumin Egg , whey protein isolate , cocoa powder, guar gum, chocolate aroma peptides glutamine The whey protein hydrolyzate sweetener (sucralose). Plus za skład i dopracowany smak, rozpuszczalność w normie. Generalnie dosyć ciekawa opcja w ciągu dnia. 7 źródeł białka, a więc idealnie uzupełnia braki w diecie w ciągu dnia. Kupiłem czekoladowy smak i jestem bardzo zadowolony - czekolada mocno wyczuwalna ;) za smak duże, mocne 5 !